You help me stay awake and worship my lord while people fell asleep. Don’t blame me for my intense love for coffee. It is the drink of the righteous people. Mokhtar Alkhanshali recited these lines of 14th-century Sufi poetry written by Moroccan scholar Shaykh Ali Ibn Omar Al-Shadhili. His voice echoed through space and time—not just from California where he lives to my room in New York where I spoke to him over the phone, but through centuries back in history when Muslims and coffee intimately intermingled. Al-Shadhili’s words reminisce of a time when Islam evoked reveries of prospering economies instead of the war on terror as it does today. Alkhanshali aims to restore these older imaginations, not just of Islam but also of Yemen—now a war-ravished land— through one of its most sought after commodities: coffee. 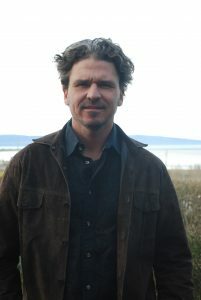 His story is documented in Pulitzer Prize finalist Dave Eggers’ upcoming non-fiction book The Monk of Mokha. 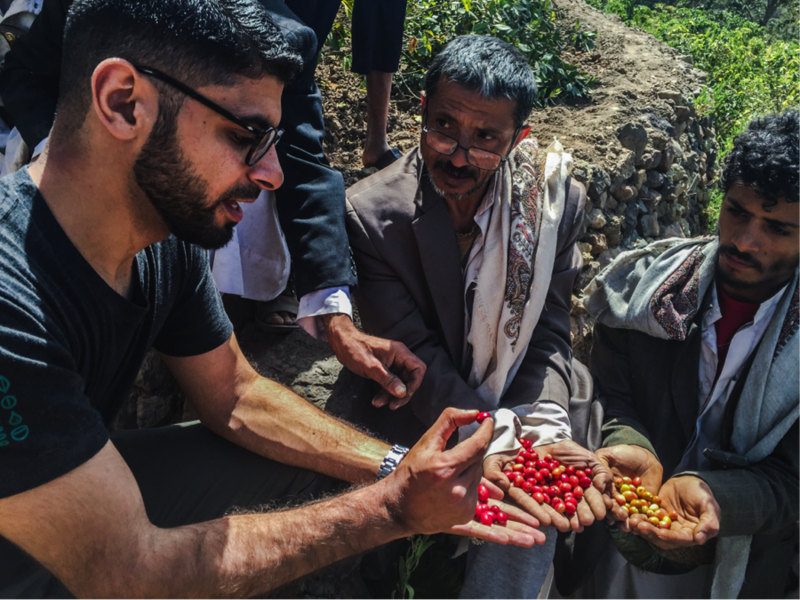 Eggers chronicles Alkhanshali’s journey to start a business producing and exporting Yemeni coffee amid a civil war. 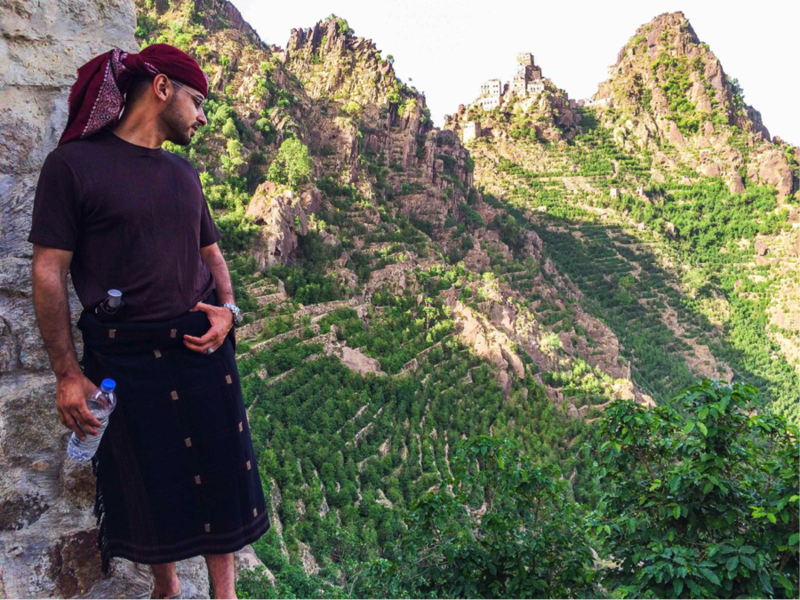 As we unravel the 29-year-old’s tale, we also uncover the history of the multibillion-dollar industry of coffee that began in Yemen centuries ago and provided the impetus for his journey. According to folklore, coffee was discovered in ninth-century Ethiopia by a goat-herder named Kaldi, when he noticed his goats were more energetic than usual after eating fruit of a particular bush. This was the coffee fruit that held the coffee bean in its belly. While Ethiopians discovered the bean, Yemen is where it was first harvested and roasted from round ripe red cherries found in the highlands near the Red Sea. It was Yemenis who gave the drink the Arabic name of “qahwa,” from which the word “coffee” derives. Al-Shadhili was among the first to turn coffee beans into the charcoal-colored brew consumed around the world today and for that reason he was called the “Monk of Mokha,”—the inspiration behind Eggers’ book title. In the 1400s, coffeehouses became the focus of intellectual life, bringing together people of all social classes. Muslim leaders began to see coffeehouses as a space that could breed possible social revolutions. In response, clerics in Mecca, Cairo and Istanbul issued fatwas prohibiting the consumption of coffee, comparing its intoxicating effects to that of wine. Murad IV, sultan of the Ottoman Empire between 1623 and 1640, went as far as imposing the death penalty for anyone found drinking coffee. Eventually, all efforts to ban coffee were wasted and religious scholars ruled that coffee was permissible. Coffee beans made their way from Yemen to Europe in the 1600s. As other parts of the world began to cultivate their own coffee, by the 21st century, Yemen’s coffee trade was dwindling with farmers turning to growing the more profitable qat, a herbal stimulant. Over time, the Yemeni art of carefully cultivating and harvesting coffee was lost and coffee from the region was considered inferior to coffees grown around the world. That is until 2015, when Alkhanshali paved his own path in history by exporting the first high-quality coffees from the port of Mokha in over 80 years. Alkhanshali grew up in the Tenderloin neighborhood of San Francisco, sharing a one-bedroom apartment with his parents and six younger siblings. He knew next to nothing about coffee or how its industry operated. Inspiration struck when he worked as a doorman at a luxury high-rise and saw a statue across the street of a Yemeni monk drinking coffee. “Alhamdulillah, I found my calling in coffee,” Alkhanshali said. This was the turning point for him in what is an incredibly impressive journey to establish his coffee business. He trained to become a Q-grade taster and traveled across Yemen establishing relationships with coffee farmers and collecting samples. But when the time came for him to return to Seattle to attend a major coffee conference that would determine the success of his career in the industry, Saudi bombs rained over the Yemeni capital city of Sanaa, closing airports. He found himself trapped as a civil war raged. Yemen has become one the largest humanitarian crises in the world, leaving 27 million people in need of aid as they face shortages in food, clean water, medicine and electricity. Yemen is also experiencing the worst cholera outbreak in history. The U.S. is still doing its part in fueling the war, he added. In May, the Trump administration struck a $110 billion military arms deal with Saudi Arabia. These weapons are being used to kill Yemeni civilians. The U.S. also abandoned American citizens in Yemen to find their own means of escaping, including Alkhanshali who made a harrowing getaway with his coffee samples through the port of Mokha on a tiny fisherman’s boat to Djibouti. With the challenges of operating a business in wartime, it’s no wonder Alkhanshali’s coffee sells for the high price of $16 per cup. “Honestly, I thought by the time the book came out, the war would be over,” he said. But the future of Yemen remains uncertain. I disagree. Alkhanshali’s story represents the antithesis to the American Dream that romanticizes individualistic capitalism; exceptionalism of the nation-state; and “pulling yourself up by your bootstraps”-type philosophy. Contrarily, Alkhanshali’s narrative demonstrates the way America has racialized opportunity structures, blocking immigrants and their children from accessing resources to prosper. 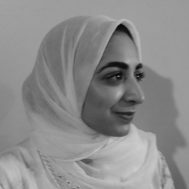 Whether it was the lack of affordable housing, the skyrocketing price of higher education or the history of anti-immigration policies that founded the Muslim travel ban, Alkhanshali’s narrative is littered with hurdles meticulously placed to block the upward mobility of immigrants and their children. It is important emphasize that it is often America’s self-serving economic and foreign policies that destroy people’s opportunities in their ancestral homes and trigger their desire to migrate in the first place. Instead, Alkhanshali’s story epitomizes people’s moral courage. One where friends, family and sometimes strangers are brave enough to invest time and money in a diaspora kid—one of their own—who has no education or experience to his name. A diaspora kid who in turn, has made it central to his mission to uplift his fellow workers and community members. “To be chosen to try to represent Muslims, Yemenis and coffee farmers—it’s a lot that weighs on me,” Alkhanshali said. Moral courage is far from under threat in the U.S. where people across the identity spectrum have united in their resistance against the xenophobia espoused by the Trump administration. The process to unite hasn’t been perfect, but nonetheless determined. No better is that captured than through Alhkanshali’s Mokha Foundation, which partnered with the Department of Brewology to create a protest poster that reads, “COFFEE IS AN IMMIGRANT.” The poster reflects the same red-white-blue print as the Shepard Fairey images that are the faces of the Women’s March and its proceeds will benefit Yemeni farmers. Indeed Eggers’ dynamic and explorative book does just that. Alkhanshali’s tale builds bridges between people, places and times no longer easily accessible—whether it’s due to politics, geography or simply physics—recognizing the ways communities of color have long been a creative force in defining America, despite its historical insistence that they do not belong. 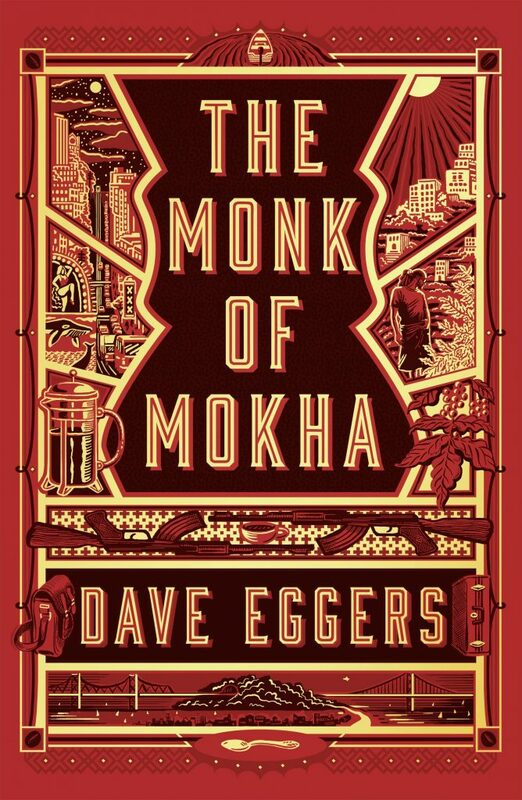 Dave Eggers’ The Monk of Mokha is available on Amazon.